What Are Ketones & What Can They Do for Me? As you might know I’m always looking for new and better ways to improve health for myself personally and for my patients. For the past 6 months or so I have been looking for a way, other than using HCG and a very low calorie calorie diet to help my patients lose weight. I’ll explain why in a moment. Recently, I was introduced to a new product that contains exogenous Ketones. I was immediately interested in this product because I have been playing around with variations on ketogenic diets (such as the HCG diet I offer in my practice) and intermittent fasting, for over the last 8 years in order to find the most beneficial way to lose weight and sustain the weight loss, to decrease pain and inflammation (especially for my autoimmune patients), to decrease insulin resistance and A1c levels, and improve energy and ultimately increase brain health, life span, and quality of life. Up until now, the best thing I had found was the HCG assisted (or Metabolic Weight Loss Program) Diet that helped me lose 50 pounds in 2010…and keep it off. I have been using this diet in my practice ever since to help my patients lose weight, overcome metabolic syndrome, resolve digestive conditions (IBS, IBD, Crohn’s disease) decrease their dependence on medications, and clear up inflammation that contributes to a whole host of health conditions. These patients may have a ton of obstacles that prevent them from exercising as they should in order to promote weight loss and wellness in the traditional sense, so this diet is a great fit for these patients. In my opinion, the HCG diet was what seemed to work the best to get the sugars out, get the inflammation down, and get them into ketosis to lose weight quickly, keep them motivated, and improve their overall health. There has been an unbelievable amount of research around calorie restriction and low carb diets for brain health and also on getting the body into a state of “Ketosis”. This means instead of relying on glucose for energy, we can force the body to break down your stored body fat for energy. Using fat for fuel is physiologically clean and green as for every gram of fat metabolized for fuel you get twice as much energy output compared to glucose and NO free radical production. Free radicals are the by products of oxidative stress and age the body. What exactly is Nutritional Ketosis? The “keto” in the word ketosis comes from the fact that it makes the body produce small fuel molecules called “ketones”. This is an alternative fuel for the body, used when blood sugar (glucose) is in short supply. Ketones are produced if you eat very few carbs (that are broken down into blood sugar) and only moderate amounts of protein (excess protein can be converted to blood sugar). Ketones are produced in the liver, from fat. They are then consumed as fuel in the body, including by the brain. This is important as the brain is a hungry organ that consumes lots of energy every day, and it can’t run on fat directly. It can only run on glucose… or ketones. It’s a common misconception that the brain needs carbs. The truth is that the brain happily burns carbs when you eat them. But if you don’t eat too many carbs, the brain is happy to burn ketones instead. This is an absolutely necessary function for basic survival. As the body can only store carbs for a day or two, the brain would quickly shut down after a couple of days without food. Alternatively it would quickly have to convert our muscle protein into glucose – a very inefficient process – just to keep the brain going. That would make us waste away quickly. It would also ensure that the human race could hardly have survived all those millennia before we had 24-7 food availability. Fortunately our bodies have evolved to be smarter than that. Normally we have fat stores that last so that we can survive for many weeks (if not months) without food. Ketosis is how the body makes sure that the brain can run on those fat stores too. Bottom line: We do not need to eat any carbs at all. The brain can happily run on fat. Many people even feel more energized and focused when the brain gets to run on ketones, made from fat. And it certainly speeds up fat loss, if you’re trying to lose weight. Since the brain and nervous system are made from fat and cholesterol, being in nutritional ketosis can have a calming effect on the body to improve sleep. But the health benefits don’t stop there – the most amazing research being done today in regards to a ketogenic diet is on brain health and mitigating or even reversing Alzheimer’s, Dementia, Brain Injuries and Epilepsy. So how do you get into a state of ketosis and start burning fat?? Up until recently, there have really only been 2 ways to achieve this: (1) the first way to do this is to follow a traditional ketogenic diet, which consist of high fat (really high – 70-80% of your caloric intake), moderate protein and very low carbohydrate (from veggies only and not more than 20 grams) . To do this you need to increase high quality fats in the diet like avocado, grass-fed butter, nuts, and seeds and strictly reduce overall carb intake. OR, (2) you can go with a Very Low Calorie Diet (VLCD) which is low carb, sugar free and fat free. I find that patients are hungry on this diet and crave…well, everything. That’s why I incorporate HCG to increase mobilization of stored fat to use for fuel. By adding the HCG, my patients aren’t hungry and don’t have cravings and their energy level is sustained. Either diet you choose, it has to be sugar free and complex carb free. Now, there are obstacles to both of these methods. The traditional high fat ketogenic diet, requires strict counting of macros and exercise for the best results. Also, this type of diet takes time…it may take 1-3 weeks to get into ketosis and to get your calorie intake and macros right for fat / weight loss. Also, if you consume sugar or starches, you are knocked out of ketosis and you have to begin again. With, the HCG assisted VLCD, the only real obstacle is that you can’t exercise when you are eating so few calories, because there just isn’t enough ketone and energy production to sustain strenuous physical activity. Any change in dietary habits requires dedication and discipline to stay the course. Also, the pink elephant in the room is: Eating a ketogenic diet is HARD! Even people who have the help of the HCG or those who love to work out and are committed to a high fat ketogenic diet fail. They want that glass of wine or beer and they slip up with carbs somewhere along the way and it takes typically 4-7 days again of doing it perfectly again to get back into ketosis. Because we have been carbohydrate junkies most of our lives and are not used to producing Ketones from fats our bodies simply don’t do it automatically, at least not with a lot of precise effort over time. It may take someone a few days, a few weeks or a few years in some cases to actually get into ketosis and stay there long enough to start experiencing the benefits. But, here’s the exciting part and the reason I’m typing this blog: Now we have a third option and maybe the easiest: (3) we can add exogenous ketones to the diet to get you into ketosis faster (fat burning mode) and keep you there. Drinking just one serving of ketones a day facilitates ketosis, and keeps you there despite a dietary slip ups. As you know, when your body is in ketosis it is literally a FAT BURNING machine! I have taken Keto// OS personally and it lives up to the hype. In fact I would say this is the most revolutionary supplement to hit the health and fitness world in the last few decades if not ever! These ketones help us get into ketosis right away, even despite the glass of beer or occasional baked potato which means we start to be able to experience the benefits of ketosis right away. I tested Keto/OS on myself both with my HCG diet (2) and with a traditional ketogenic diet (1). I saw amazing results in my ability to burn body fat, increase energy and improve mental focus and clarity. (Quite simply our bodies work better on Ketones.) I prefer to walk the walk, and eat my own dog food as the saying goes, so I test products that I promote on myself – I would never ask you to do something that I wouldn’t do myself. So, after the New Year, I got on my own HCG program and I began to lose my ½ to 1 pound per day as typical. But about a week in to my program, I introduced the Keto//OS. I just drank 1 packet each morning: It doubled (DOUBLED) my weight/fat loss during the 5 days that I took it, helping me to burn off 2 to 2.5 pounds per day!! Amazing!! I said to my husband, “Do you know what this is going to do for my patients who need to lose a lot of weight”? Talk about motivation and encouragement to see that scale drop each day!! Here’s the other thing I learned while on the HCG protocol and taking my ketones- I had MORE energy, and I the achyness in some of the joint/bones I had broken didn’t hut at all while taking the ketones. My HCG patients who have incorporated the ketones, just like me, are seeing double the weight loss. My Olympic weight lifter had 3% body fat loss in just 10 days – for her adding Keto//OS was a game changer in her workouts. Cross fitters saw increased fat loss and sculpting of their muscles. My patients who changed nothing had some initial weight loss (they do not exercise) but incredible energy and mental focus. A patient from IL contacted me and decided to follow a traditional ketogenic diet and incorporate the Keto//OS and she lost 6.5 pounds in just 5 days! So, now if you are interested in my Metabolic Weight Loss Diet using HCG , know that when you do this diet, know that you will get all the benefits of nutritional ketosis, because this is a ketogenic diet. If you love to exercise, then I can help you get started on a more traditional ketogenic diet (modified) , incorporating the Keto//OS to accelerate you body’s transition into ketosis and keep you there so that you have more energy, clarity and better work outs. And, I haven’t even told you the best part: Ketones are intricately linked to brain health, brain injury recovery, and protective against Alzheimer’s, Dementia, Depression and neurological disorders. There is a ton of information on my Everything Keto page. Start by watching the video. If you’re ready to get started re-shaping your body, reducing inflammation, improving your brain health, or just have questions, call (239) 243-8735 and schedule your consultation. Dr. Hoch (pronounced Hoke), is a 1988 Graduate of Peotone High School and a 1990 Graduate of Joliet Junior College. She Received both her B.S. in Human Biology (1991) and her Doctorate of Chiropractic (D.C.) (1993) from The National College of Chiropractic in Lombard, IL. She also received her graduate and post-graduate certifications in Acupuncture from NCC. Dr. Hoch practice Functional Medicine, which is a way to address and resolve the root causes to medical conditions without the use of medication. 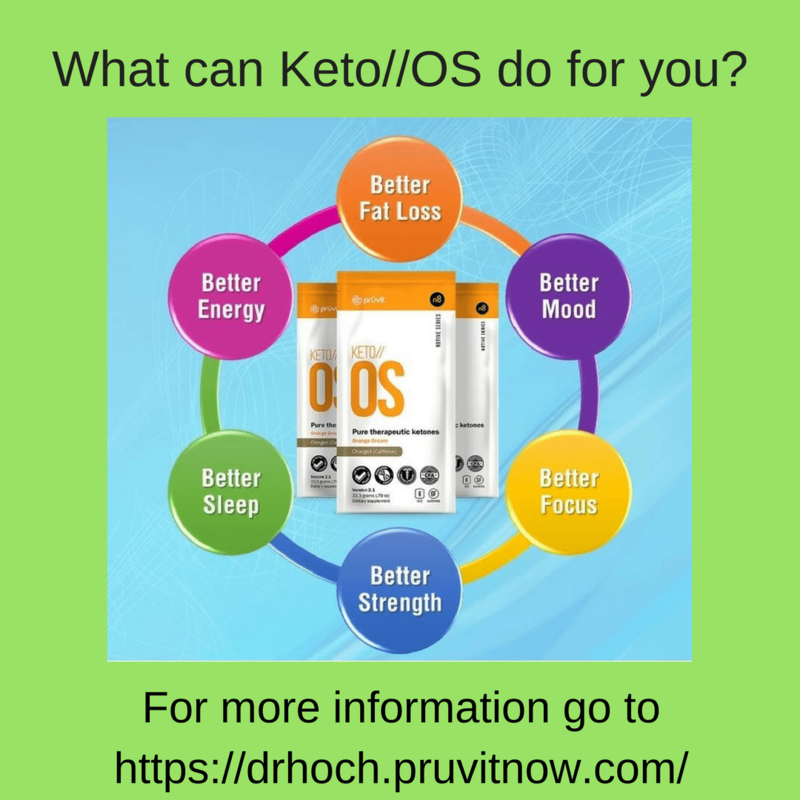 Dr. Hoch had me try Keto/OS a few weeks ago when my weight loss stalled and I was at my wits end with the VLCD. I felt an immediate improvement to my brain function and my mid-morning hunger was gone. I split a package of ketones and drink half in the morning and half at noon. My weight loss has picked up but more than just the number on the scale, I can actually feel the fat loss. Ketones have been a game changer for me.